The journey to the fishing spot is a good time for last-minute preparations. Store your gear neatly – it makes moving about easier. Some of the best fish, like this conger, are found a long way offshore, which means booking a fast boat to get you there quickly. Charter boats are often quite crowded, and even when there aren’t too many anglers, it can be hard enough to move around without having to step over boxes of bait and bags of gear. 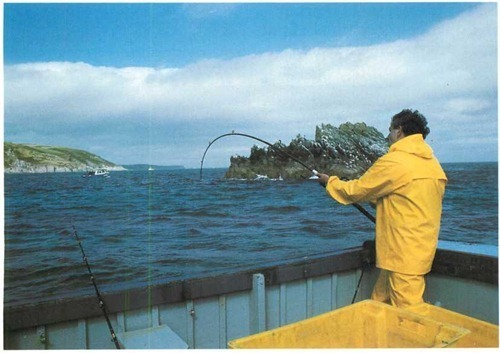 Keep everything as neat and tidy as you can and watch out for crossed lines, especially when you are playing a fish. Inshore boat fishing doesn’t always mean smaller fish than those from farther offshore – as this angler is finding out. But with less tide and depth you can often use lighter tackle. 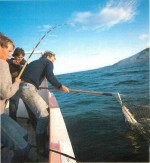 Tackle shops at your chosen venue can often recommend a skipper. Make sure that this recommendation is based on the skipper’s skill and the quality of his boat and not because he pays the tackle shop a percentage. 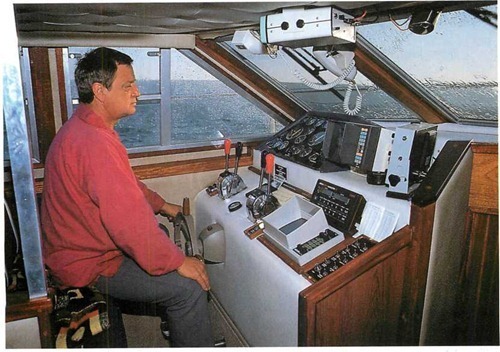 Always make sure that you know the skipper’s name, the name of the boat and exactly where you are going to meet. On a trip a long way offshore, a life raft like this is a reassuring sight. 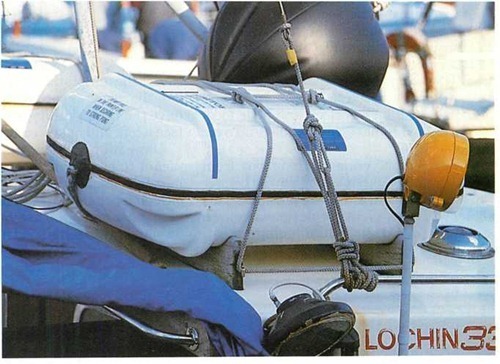 A skipper with a DOT licence is obliged to carry relevant safety equipment, but you can always ask to see it. The cabin of a modern charter boat can be a very high-tech place. 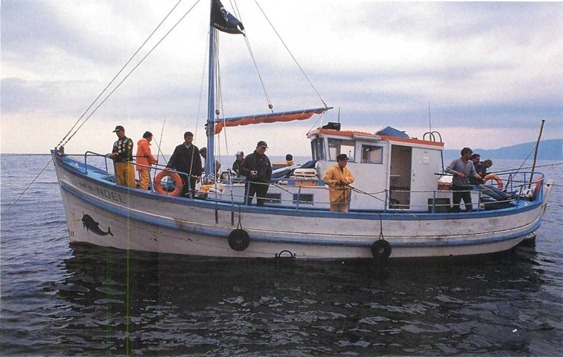 Some skippers don’t like anglers to use the cabin or other facilities uninvited. It’s always better to ask first. Once you’ve found the fish the action can be non-stop. At the end of the day, you might wish you’d brought a spare pair of arms with you. 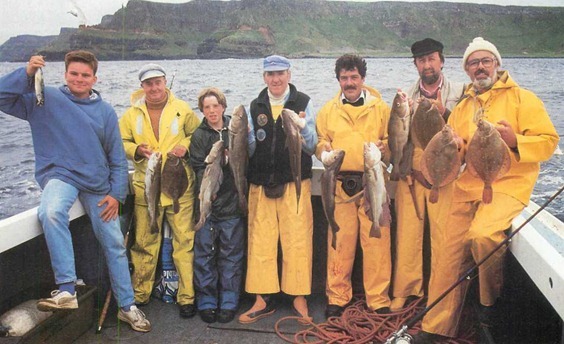 You can catch all sorts of fish from a boat, though you have to feel sorry for the bloke on the left who’s posing with the bait. Booking a trip on a charter boat can be a real headache if you don’t know where to start or what to watch out for. Skippers often find single bookings more trouble than they are worth. When a group books the boat, the skipper gets the whole fee no matter how few anglers turn up. If he takes individual bookings, each angler usually pays a flat rate of about 10% of the whole boat rate. If too few anglers book, or some of them fail to turn up, the skipper could end up out of pocket. To an outsider trying to book a day out for himself, charter boat angling often appears to be a closed shop. The most productive tides are usually reserved for regular parties, and many skippers are reluctant to take individual bookings. The reasons for this are straightforward. Any sensible businessman looks after regular customers first — a party which books twenty days a year expects to get some of the best tides. A new customer who might not come back for more usually has to make do with the less productive tides. As an individual you have even less chance of getting one of the best tides. One solution to this problem is to leave your phone number with a reputable skipper. Tell him that you are interested in making up the numbers if one of his regular parties needs an extra angler. 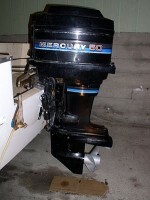 Weekend boat places are usually in greater demand than weekday ones. If you can get a midweek day off at short notice you’re more likely to get to sea. This can be a shortcut to some top boat fishing. Many ports offer different opportunities, so choose a venue which provides the sort of fishing you fancy. If you want to use your own tackle, you may find your options are limited. 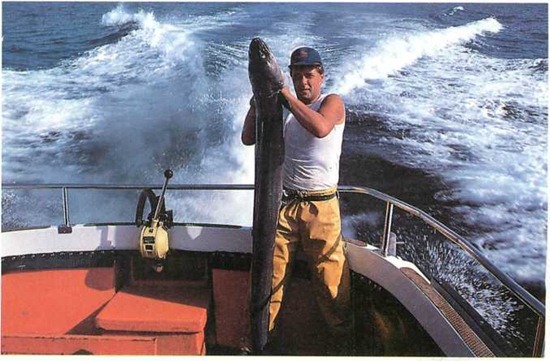 Most types of boat angling call for specialized equipment. Make sure you know what gear you’re going to need for whatever type of fishing you plan to do. A trip out from the Hampshire coast often requires a wire line kit to cope with the deep water and strong tides, while fishing off the Essex coast usually means much shallower water and boatcasting equipment. Both of these methods are used at anchor, whereas a trip from Whitby might mean fishing pirks and muppets on the drift. You may find it useful to join a sea angling club (details from your local tackle shop). Many of them book a series of dates every year for members. Even inland cities and towns have such clubs, some of which exist solely to arrange a few days boat fishing every year. This does save you effort, though it can mean less choice. Having decided on a venue, the next step is to find a good skipper. The advertisements in the angling press can be a good place to start, though many of the best skippers rarely need to advertise. Word of mouth or reports of big catches in the press are often better pointers. Under normal circumstances, the best skippers are booked up well in advance, and you are unlikely to get a place on a successful boat at short notice. 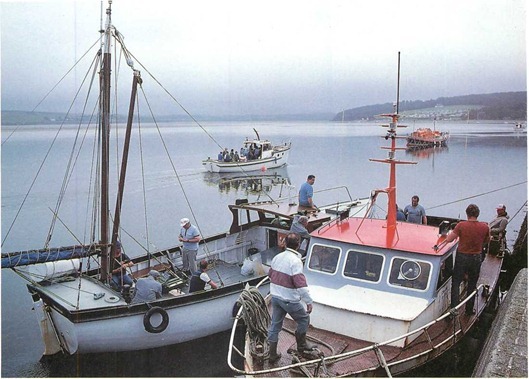 To get afloat on a specific day you might well have to phone up a number of skippers before you find one with a space available. At all costs avoid the cowboys who go afloat without licences and insurance. They may be cheaper and easier to get out with than a professional skipper, but there are other considerations. Nobody would get into an unlicenced, uninsured taxi, which had no MOT certificate, and a driver who hadn’t passed the test. Treat charter boat skippers in exactly the same way. If you are unfamiliar with the skipper, it’s always worth asking if he has a Department of Transport (DOT) licence and passenger insurance before making a booking. A good skipper won’t be offended – he’ll probably be pleased that you are concerned. After all, it’s his livelihood, and every angler taken out by an unlicenced boat is one more customer lost to the licenced skippers. The skipper also knows which species of fish you can expect and what tackle is required. If you need it, remember to ask whether tackle is available and if bait is provided. Sometimes bait is included, but at other times you’ll need to pay extra. 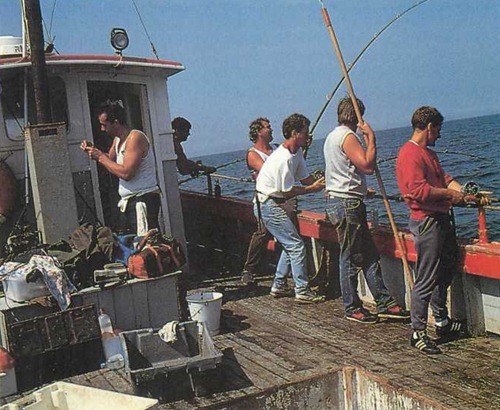 You know what fish you’re after, where you’re going to fish and with whom. Now you need to know whether you’ll be charged a flat individual rate, or a share of the whole boat booking price (which depends on the number of people aboard). Once you’ve agreed the terms of the booking, you should send a brief letter outlining your requirements and the agreed costs. As an act of good faith you should also send the skipper a deposit of up to half his fee. With a new customer some skippers insist on a deposit before accepting a booking. This deposit is returnable if bad weather forces a cancellation but you are still expected to pay for any perishable bait the skipper has ordered for you. It’s worth remembering that the weather can often be bad enough to make the trip uncomfortable without forcing a cancellation. Be ready for this by bringing suitable clothing. A one-piece waterproof suit made specifically for anglers offers the best all-weather protection. It’s better to bring too many clothes than to be cold and wet all day. Sea sickness — the scourge of the inexperienced boat angler – can turn an enjoyable day into a nightmare. Anti sea sickness tablets work for many anglers but there are other ways to minimize your chances of illness. An excess of alcohol the night before, combined with lack of sleep and little food, is guaranteed to have you doubled-up over the rails all day. If your chosen venue is a long way from home, think about travelling down the previous evening and staying overnight. This allows you to get plenty of sleep and enjoy a leisurely breakfast before going afloat. Resist the temptation to have a drink at the bar the night before and make sure you have the right clothing, otherwise you may face a cold and nasty ten hours. Above all remember that boat angling is meant to be enjoyable. Don’t spend lots of money booking a top skipper if you get sea sick on a pedalo. All of these rules are common sense and if you use yours, you are well on your way to some good fishing.